Family-oriented actor, Moses Chan (陳豪), is flying to Taiwan to film various scenes in Assassin <殺手>. In regard to his wife Aimee Chan‘s (陳茵媺) pregnancy rumors, Moses denied this was true. But the couple loves having a big family and would consider having a fourth baby. “People were congratulating me. I didn’t know what happened. Thanks, but everyone is rushing it a bit. I won’t cross out the chance of having another baby, but it won’t be so soon. Though my wife really love kids, it’s a really busy time for us in terms of career and children so these things will have to wait,” Moses said. 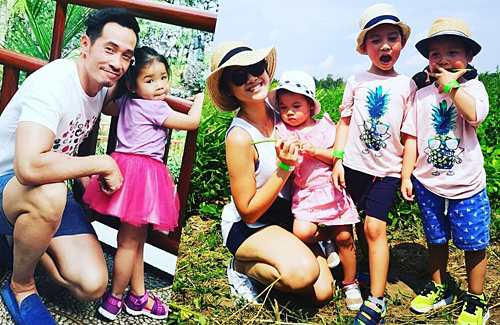 With his three-week stay in Taiwan, Aimee and their three children will be visiting him during the school break. Though they will be visiting, the family of five already pre-celebrated Halloween, in which they all dressed in denim. Actors like Moses and Wayne will not need to take any risks. They can maintain a very good income filming series, endorsements, making event appearances whilst spending time with their family. They should ink a tattoo ‘TVB Forever ‘ tbh…. What a beautiful family!! Didn’t Moses say they’re stopping having more kids after they have their daughter? I guess he changed his mind? I remember he said 3 is enough since they’re trying for a girl then their wish did come true.